The easiest way to make delicious, naturally sweetened pineapple tequila at home! Fresh pineapple and silver tequila infused together is perfect for a refreshing cocktail or to sip on crushed ice. Remove the skin and core of the pineapple and cut into thin spears. Arrange the spears in the mason jar, filling it until it’s about 3/4 full. You want as much pineapple as you can, but still leaving room for tequila. Pour the tequila into the jar until it covers the pineapple. Seal the container and refrigerate for 4 to 7 days allowing the tequila to infuse with the fresh pineapple. 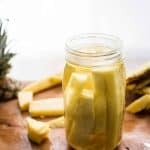 When ready to use, strain the tequila from the pineapple, discard the pineapple and use in your favorite margarita recipe or just sip over crushed ice.